Training had gone pretty well, apart from one long run where I didn’t take on board the right fuel and hydration (a good lesson to learn four weeks before race day! ), and my final long run of 22 miles went really well. During training, I had played around with pace, and did a few runs or sections of runs at goal pace. I had in my mind that this would be roughly 8:30 min/miles, meaning a marathon time of just over 3hrs 42mins, which would also give me my desired ‘good for age’ time. I tapered as per ‘the plan’ and tried to rest as much as possible in the week leading up to race day, as well as making sure I ate plenty of carbs. As it was my birthday the day before the marathon, the hubby and I had a lovely child free afternoon and evening in Chiswick, where I made sure to continue my carb loading!! I ensured all my kit and gels were ready for the morning, and then had an early night in preparation for the big day! After a slightly unsettled night (with the obligatory pre-race nightmare!!) 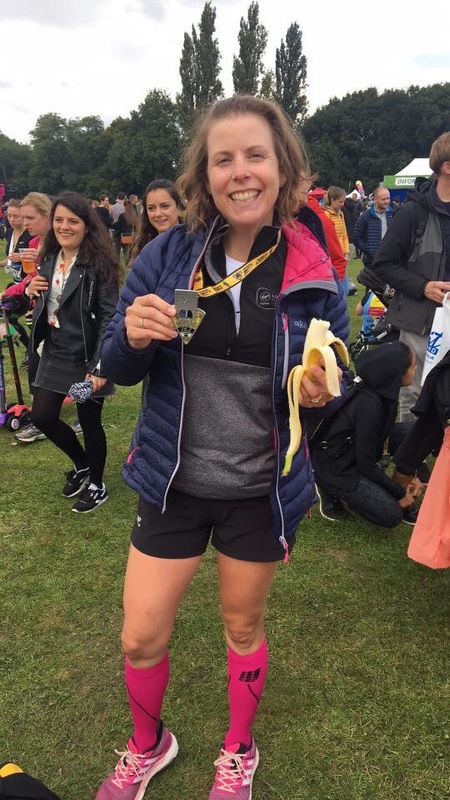 I got up early and had porridge with a banana (my go-to breakfast) before heading to Kew Gardens and the start of the race… It was a crisp and cool morning, slightly overcast, so perfect running conditions, if a little different to Brighton! Being at Kew Gardens, there were plenty of toilets, meaning a stress free wait for the start. It was a much smaller event than Brighton, so I was able to hang around near the start, and chat to a few other runners. 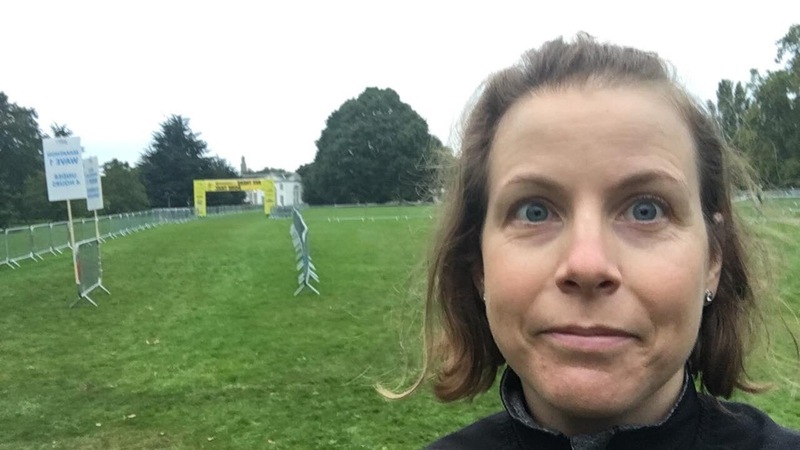 I ended up talking to a couple of girls who also ran Brighton, and we commented on the differences between the two events (weather, number of runners, and likely reduced crowd support on the course). Finally it was time to set off! I set off a little fast, but kept an eye on my pace and heart rate, and enjoyed the first few miles running round Kew gardens. A few runners went past me, but I kept telling myself that this was a race against myself, and that I may well see them again as I wanted to keep a steady pace until the bitter end. Those first 6 miles seemed to fly by, and before I knew it we were leaving Kew and heading down onto the Thames path. Here we came across a few recreational runners and dog walkers, some of whom seemed most put out that we were running towards them! After several miles of running beside the river, we looped back and went over Kingston Bridge for the first time. We then headed towards Hampton Court palace. At this point I started to pass some of those runners who had sped past me early on, and I decided my strategy must be working! King Henry the VIII was waiting at Hampton Court, so I high-fived him and carried on my merry way, enjoying the beautiful scenery of the palace. Here, we looped back around at the 15mile mark, and started to head back towards the finish… There was a long stretch where you could see the runners behind and I was able to shout a hello to one of my fellow Brighton girls, and also start to see some of the slower runners near the back. I continued to run at a steady pace, managing to maintain between 8:20 and 8:40 minute/miles, and felt confident and comfortable that I could finish with a good time. I kept to my fuelling strategy (a gel every four miles or so) and drank little and often (there were plenty of stations with water and/or lucozade). At this point, I started to see some of the half marathon runners, as well as some of those marathoners who had set off a bit too fast. As it was now a more respectable time in the day, there were a few more people out and about round the course, who shouted lovely words of encouragement. At mile 23, I finally allowed myself to check my time (I think I now have a bit of a superstition about this, as I did the same at Brighton) and I was at 3hrs 13. I knew I was on target to finish in under 3.45, so that gave me a real boost. Around this point I also became aware of someone hot on my tail, and I was waiting for them to come past. He only did so once we got into Old Deer Park, where he told me I had helped him get through the last few miles as he had been following my bright pink socks! Now the finish was in sight, I started to look out for my family and friends.. My eldest son and his friend spotted me first, and ran a few hundred metres with me, before I headed into a very long and winding finish! It was lovely to have family and friends there to cheer me on through the final stretch, and I was able to finish strong. After making my way through to collect my medal, drinks, snacks and t-shirts, we headed off for a well-deserved roast dinner and a few glasses of wine! I would thoroughly recommend Richmond marathon to anyone considering it. A nice, flat and scenic course, with plenty of hydration on route, and certainly some PB potential. As for me, I’m chuffed to bits to have achieved a new PB, and already looking forward to the next marathon!